Among the best-liked of tropical aquarium fishes, Corydoras and Aspidoras catfishes are appearing in an astonishing diversity of new species, many of them small in scale and perfectly suited nano-size tanks. In the next issue of AMAZONAS, catfish expert Hans-Georg Evers takes the reader into the native South American waters where these new and exotic corys are being discovered and looks at their keeping and breeding in home aquaria. Breeders Robert and Ulrike Budrovcan reveal their secrets in breeding the challenging Shy Cory, Corydoras gracilis, which may now be extinct in the wild. • Caribbean Mollies: Adeljean Ho explores the ABC Islands (Aruba, Bonaire, Curaçao) in search of the alluring Van de Poll’s Molly, Poecilia vandepolli, a must-read for all livebearer enthusiasts. AMAZONAS Volume 2, Number 5. Click cover for larger view. • Midas Cichlids: The large, colorful members of the genus Amphilopus are of special interest to cichlid lovers, and Henrik Kusche takes an expert look at their origins and their keeping and breeding in the aquarium. 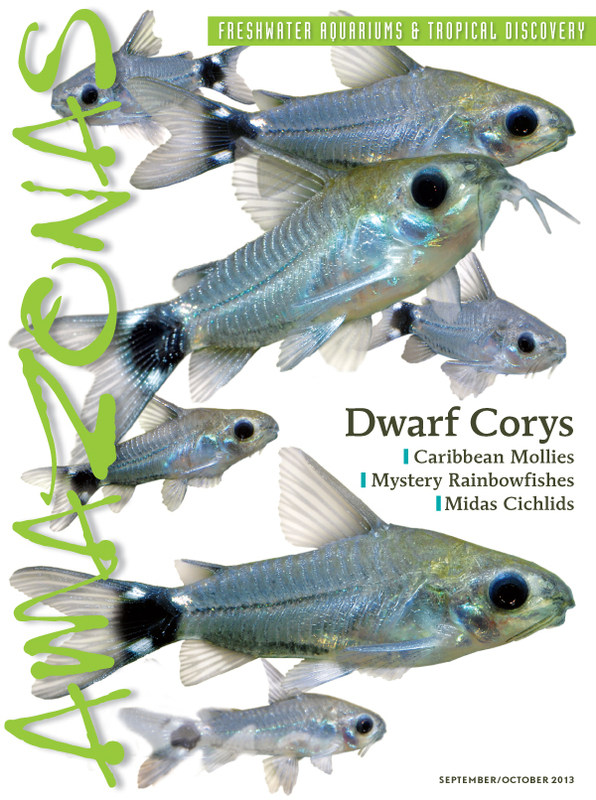 • Mystery Rainbowfishes: Christophe Mailliet offers eyeopening profiles of Madagascar’s mostly unknown or unidentified rainbowfishes in the genus Bedotia, some that deserve more attention from aquarists and breeders. • Zagros Pupfish: A profile of a beguiling, hardy killifish, Aphanius vladykovi, for aquarium, balcony and pond by Frank Kronke. • Planted Tank Winners: Images of the prize-winning aquascapes at this year’s international The Art of the Planted Aquarium competition in Hannover, Germany. The issue has an on-sale date of August 13th. The print edition of AMAZONAS in English is now distributed in the United States, Canada, the United Kingdom, Australia and New Zealand, South Africa, France, India, the Netherlands, Malta, and elsewhere. The Digital Edition is read in more than 100 countries worldwide. To find a local or regional dealer who offers AMAZONAS, visit our current directory. AMAZONAS is published bimonthly by Reef to Rainforest Media, LLC in Shelburne, Vermont, in partnership with Natur und Tier – Verlag GmbH, Muenster, Germany.